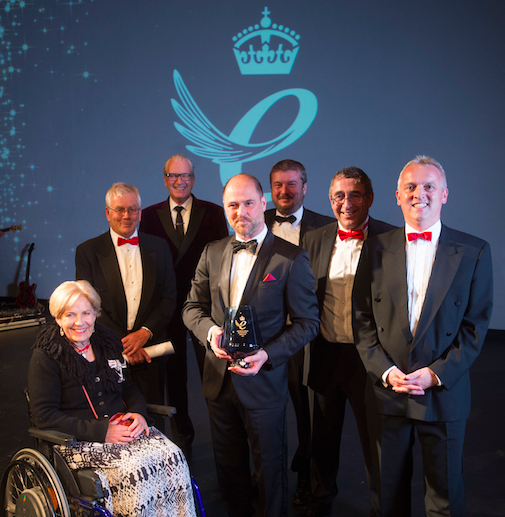 Claims Consortium Group has been officially presented with its Queen’s Award for Enterprise by Her Majesty’s Lord Lieutenant of Somerset, Mrs Annie Maw – the Queen’s representative in the county. The presentation took place at our annual staff and supplier awards evening on Friday 22 September, and was attended by Rebecca Pow MP, Chairman of Somerset County Council William Wallace, and other local dignitaries. The evening not only marked the firm’s Queen’s Award win, but the outstanding achievements made by staff and suppliers over the last 12 months, with 15 awards handed out in total. Claims Consortium also supported local charities during the event – an additional 60 meals were catered for Taunton Association for the Homeless and guests wore something red to show support for anti-violence charity Stand Against Violence. Claims Consortium won its Queen’s Award for Enterprise in Innovation earlier this year, one of around 100 companies in the UK to have received the coveted award. The Queen’s Awards recognise businesses for their outstanding achievements in innovation, international trade and sustainable development, and are widely regarded as the highest official UK award for a British business.